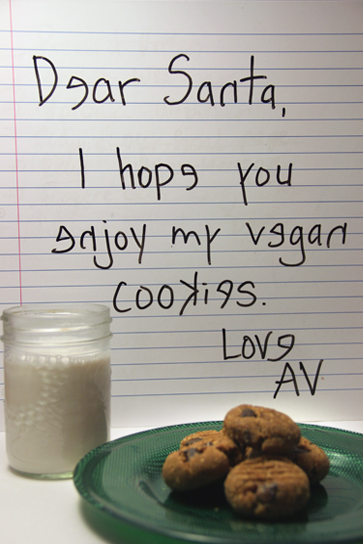 These cookies are high protein, low sugar, vegan, and naturally gluten-free. Plus with no grainy gluten-free flours, these cookies stay moist and gooey in the centre for days. 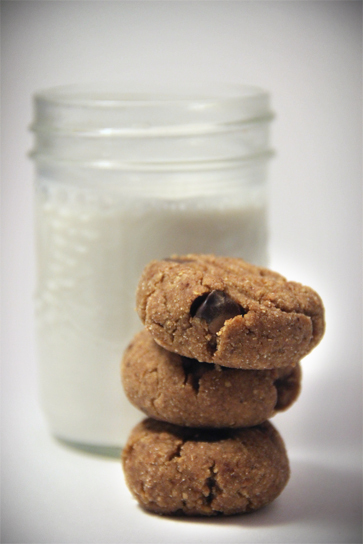 I use roasted almond butter which gave the cookies nice nutty flavour. For the ground flax, I grind my own in my Vita-Mix from golden flax seeds. A coffee grinder also works to grind seeds. The first time I made these I used cocao nibs which made the overall cookie not very sweet. When made with chocolate chips, the cookies taste sweet with a lovely chocolate flavour. Preheat oven to 350 degrees F. Lightly grease a large cookie sheet with coconut oil. Place the pitted dates and water in a blender and let them soak for about 5 minutes. Then add the coconut oil and maple surup. Blend until very smooth, about a minute. Transfer date-oil mixture to a medium-sized mixing bowl (scooping out every last bit) and add ground flax seeds and vanilla; beat on high with an electric mixture until combined. Add almond butter and beat again. Sprinkle the coconut flour, almond meal, baking soda, and salt over the almond butter mixture, beat again until well combined. Drop dough by the large spoonful onto the greased cookie sheet. Lightly press each cookie down with the palm of your hand or fork. Remove gently with a thin spatula and transfer to a wire rack to cool. The cookies will be slightly fragile when hot but will hold together very well after about 5 minutes of cooling. Enjoy with a glass of fresh, raw almond milk!